KUALA LUMPUR (Aug 2): Malaysian plantation shares like Kuala Lumpur Kepong Bhd (KLK) and PPB Group Bhd fell as crude palm oil (CPO) prices dropped on cheaper crude oil. CPO prices also fell as investors expected higher output and inventory of the commodity. CPO for October 2016 fell by RM2 to RM2,325 a tonne at 11:11am. CPO tracks crude oil prices as cheaper crude oil could lead to lower demand for biodiesel, which uses CPO as feedstock. At 11:32am, PPB shares fell two sen or 0.1% to RM16.06. At 11:43am, KLK slipped 14 sen or 0.6% to RM23.06 to become the fifth-largest decliner across Bursa Malaysia. Reuters reported that US crude tumbled below US$40 (RM162.06) per barrel on Monday for the first time since April, as oil prices settled down nearly 4% on heightened worries of a crude glut despite peak summer fuel demand. In Malaysia, investors could be anticipating higher CPO output and inventory, both of which influence prices of the commodity. 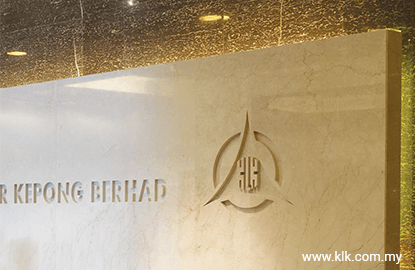 CIMB Investment Bank Bhd Bhd analyst Ivy Ng Lee Fang said CPO prices for the second half of 2016 (2H16) was projected to be weaker at an average of RM2,400 a tonne compared to RM2,517 in 1H16. Ng said CIMB expected 2H16 CPO prices to be lower "as we expect seasonally higher output in 2H16". CIMB issued its note ahead of the Malaysian Palm Oil Board's announcement on July 2016 output, inventory and export numbers. Ng said July palm oil inventory could have risen in monthly terms. "Overall, we estimate that Malaysian palm oil inventories may have risen 1.7% mom to 1.81m tonnes as at end-July 16. The official figures will be released on Aug 10," she said.